There are some very useful tools available for working on a scooter engine. You can always get by with the vise-grips but these will make rebuilding a bike a breeze. (1): Vespa GS150 Clutch Puller. It threads into the clutch housing and as the center bolt is tightened it draws the clutch off the end of the crankshaft. 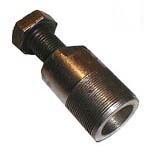 (2): Vespa Clutch Nut Tool. All engines in large frame scooters after about 1957 use a "castelated nut" on the crank to hold the clutch in place. 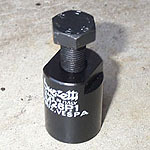 This tool is the reverse of the nut and allows you to use a standard socket set to remove it. 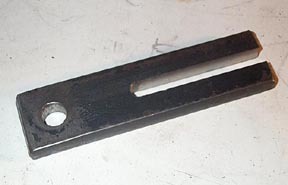 (3): Vespa Flywheel Removal Tool. This applies to all large frame bikes that have a threaded area around the flywheel nut. Older bikes use a retaining clip that is supposed to draw the flywheel off the crank as the main nut is loosened. 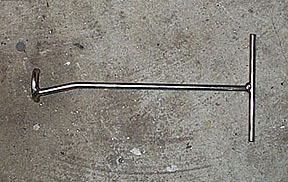 (4): Vespa Fuel Tap Tool. This allows you to unscrew the nut at the bottom of the fuel tank. It is basically an offset wrench on a long shaft. Click here to see how to remove a Vespa fuel tap. (5): Vespa small frame clutch puller: The clutch assembly on a small frame fits on to a tappered crank end shaft. A puller is required to pull it off. (6): Universal con rod holder: This tool slips over the con rod but the slot is smaller than the small end. When the crank is turned it stops the crank from reaching bottom dead center and effectively locks the crank. I got this from Rich Presley in the UK and it works wonderfully.